Since the launch of the kMeter we have received a lot of positive feedback. It’s very satisfactory that so many of you see the benefit of direct feedback in your training and that you want to go beyond counting sets and reps. Here, Fredrik Correa dives into the subject of assessing your eccentric overload. Main point: don’t just look at the overload % in the kMeter. While not requiring the investment dual force plates, the kMeter needs some workaround to fully assess eccentric overload. Do a max test (4 or 5 RM) and use average numbers in summary (peak power, force) for higher reliability. Look at all numbers in total for comparison and relate your overload sets to your 4RM. Re-test regularly, adaptation is rather fast with flywheel training, make sure you calibrate your reference values regularly (every 4-6 wks). Many see the eccentric overload as one of the biggest advantages there is with the kBox and I agree, it’s really a key feature. Eccentric training with long time under tension and low loads is inefficient and higher loading % of 1 RM is beneficial [ref] and transfers more to performance, especially in well-trained subjects [ref, ref2]. The overload zone (red) with an eccentric over-capacity (supra 1 RM loads) is well-known but not used mostly because of practical reasons. 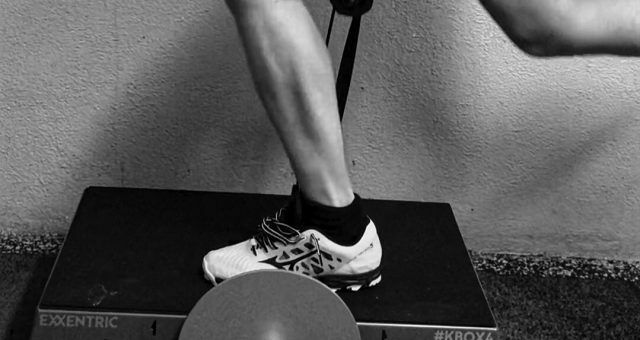 Release hooks, spotters and really slow drills do not work if you want to incorporate eccentric overload training to a larger extent, at least before flywheel training and the kBox. 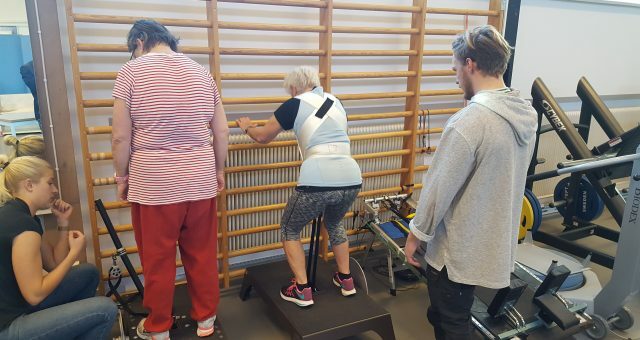 Loading up the eccentric phase, not only in isolation exercises but also in the more heavier lifts, and doing this in a safe and controlled manner in a self-contained and self-operated system is unique for the kBox. 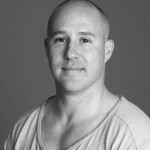 Mike Young, founder of AthleticLab, posted some really nice vids showing this [example]. We know people all around are experimenting with this on the kBox and that leads to a new question, how do we assess the overload? After writing a piece earlier on safety during eccentric overload training I think it’s time for the next phase, assessing your overload. The gold standard would be using two load cells on top of the kBox since this would give you left, right and total force during the whole rep. However, you can do without the hassle of starting up your laptop for some squats and you probably don’t have those load cells lying around anyway so lets see how we can use the kMeter for this feedback instead. 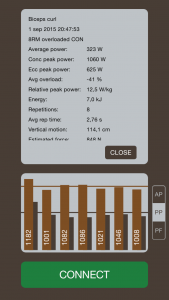 Throughout your set the kMeter gives your real-time feedback of power (average and peak) and force. 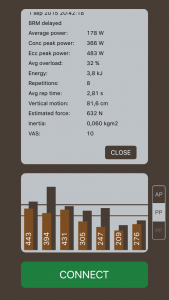 In the summary you get the % eccentric overload and the average force, we’re going to use these numbers. For more info on the numbers, check the kMeter manual. Some focus only on the % overload number but that really doesn’t tell you much if you don’t put it in context with the rest of the numbers. Think about it, if I said I had done dumbbell biceps curl with 100% eccentric overload (i.e ECC load = 2 x CON load), would you be impressed? I hope not because that could mean that I had lifted a 3 lbs dumbbell and lowered 6 lbs. Not too impressive but still a 100% overload. So, to get some meaning out of this you need to get some absolute numbers to go with to that so you can relate the percentage. My suggestion is that you use the average force. 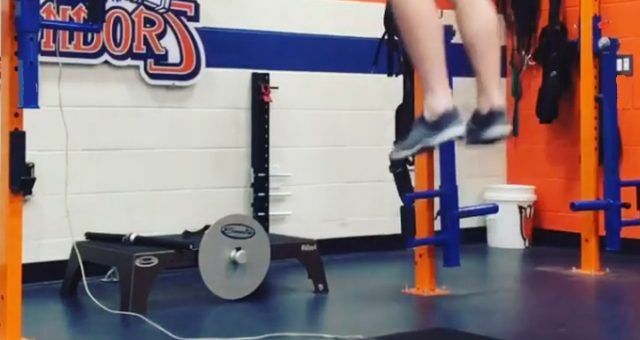 Average force is a calculated number, not measured, so it’s far from research grade so you can’t use it for comparing athletes or different exercises. But it is close enough to give you a number on your intensity during the set. First I would recommend you assess a 4 RM for that exercise. Why a 4 RM? Because your maximal rep in a maximal set on the kBox is usually around rep 2-4 and then you decline. This is because of the stretch-shortening cycle and the first maximal reps high eccentric load stimulate your muscles to produce higher forces in the consecutive reps and usually max out around rep 4 and then decline due to fatigue. If you still increase by rep 5 and 6 or even level out I would think that you hadn’t maxed out the first 3-4 reps and for some reason you are holding back. If your athletes show this they probably need more familiarisation with the kBox and/or that exercise to be able to perform maximally or they might be struggling with some pain or something holding them back. In the summary you get the peak power and that’s an average over your 4 RM. Looking in the graph you can see peak power rep by rep but using that would decrease the test-retest reliability so I would suggest you go with the peak power values in the summary. If you are familiar with our 4 RM kBoxPowerTest you will notice I used a higher inertia for this 4 RM. 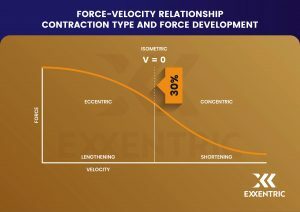 This is because that is a power test and this is a max force test similar to a traditional 1 RM so I want to place myself out to the left on the Force-Velocity curve, closer to my MVC (Maximal voluntary contraction). If you are unfamiliar with the methods for eccentric overload on the kBox here is a video showing the curl variations below in one video. The kMeter tells me that the average rep time was 3.5 seconds so I think that puts me pretty far on the left on the force-velocity curve and I don’t think the average force will go up very much with higher inertia. If you think you might then do another 4 RM with higher inertia and compare. On with the eccentrics, here is the first one, Delayed Eccentric Action , same drill but with half the inertia so the rep time drops to 2.8 seconds i.e faster motion. Now I’m doing 8RM so the total time under tension is a bit longer here in the 8RM. You can look at the energy expenditure (kJ) to assess the total work and compare between to sets. As you can see I now get a 32% overload in the ECC phase (ECC power / CON power) and that overload is also clearly visible in the graph showing CON and ECC peak power. However, since the average force drops about 37% compared to 4 RM I would say the eccentric load is about the same as in the 4 RM even though the power is higher. ECC power is a bit higher but this is only during a short time of the ECC phase due to the features of the delayed ECC action, you don’t do any work or low work through most of the ECC phase and brake hard in the end of ECC. So this is a way to emphasize the ECC overload in the end of the ECC phase but as a total overload this setting doesn’t work very well. Delayed Eccentric Action is a good way to get started with eccentric overload for familiarisation and to incorporate it gradually in your training program but not for heavy overload in well-trained subjects looking at specific effects. The benefit is that it works in all exercises since you can always delay the deceleration phase and work a bit harder in the end. In some exercises the end of the ECC phase is also the sticking point, for example the deep portion of the squat. Here the delayed eccentric action can make you work harder in the deep portion and help you build strength in this weak spot and improve your lifting and even the catch-phase in the olympic lifts. In the graph you see that the Eccentric Overload % is -41% but don’t let this fool you, the work is much harder. 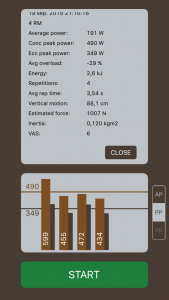 Look at the average force and you see this 8 RM set is closer to the average force in the 4 RM. 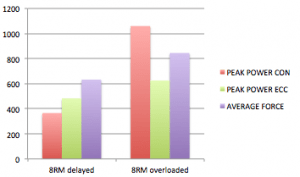 Also the ECC peak power is +29% compared to Delayed 8RM and +79% compared to 4 RM. Besides that this setting gives you a high ECC load over the whole ECC phase, not only in the end like in the Delayed Eccentric Action. And think about it, you are actually reversing the energy added with your legs using your arms, of course the overload is higher here, just don’t let the graph fool you, look at all the numbers, there are more to this than only the Eccentric Overload %. For total work, look at the energy expenditure again, 7 kJ compared to the 3.8 in the delayed eccentric action with the same number of reps.
A graphic overview comparing the delayed eccentric action and the overloaded concentric action looks like this. Eccentric load is definitely much higher in the second setting even though eccentric overload % is lower if you look at the peak power values and average force. Make a max test (4 or 5 RM) and use average numbers in the summary (peak power, force) for higher reliability. Do your training. Look at ALL numbers in total for comparison and relate your overload sets to your 4RM. Don’t overdo the overload training. Start with a low volume and progress fast instead of starting with too high volume and getting destroyed. 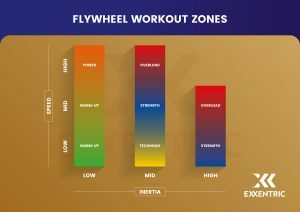 Re-test regularly, adaptation is rather fast with flywheel training, make sure you calibrate your reference values accordingly.